Everyone will be responsible for their own food. Please forward to your co-workers, family and friends. We hope to fill the theater. 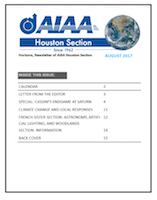 AIAA Houston Section will have a dinner event next Wednesday, December 12! The short presentation and the movie “First Man” will take place at Star Cinema Grill. Presentation at 6:30 and the movie at 7:00 pm. RSVP on the event page or on Eventbrite. Invite your colleagues, friends and family. Thank you for helping us to make this event success!